A Tornado vs.The Fed, Which Is More Destructive? It’s been a week since the tornado went through Moore Oklahoma and I have yet to see an article or comment by an “economist” saying that the destruction by the tornado will help the economy and create jobs. This is what was said after Hurricane Sandy hit New Jersey and New York, read here and here. We showed the errors of this analysis in this post titled, Hurricane Sandy and the Broken Window Fallacy. But like all shallow thinking, this fallacy will never be put to rest once and for all, so let’s be ready to shoot it down when it rears its head again. Let’s look at the similarities and the differences between the destructive power of this tornado, and the destructive power of the Fed and the Government. It’s a version of the broken window fallacy. Natural disasters destroy not only the goods that have been produced, but also the capital that produces these goods. Consumer goods like houses, cars, furniture, clothes, equipment, computers, food, etc, were all things that were produced in order to be consumed at different rates over time. Capital goods [goods used for the production of consumer goods], such as buildings, tools, vehicles, machines, computers, equipment, etc, used by businesses, where also destroyed. When you watch the videos of the Moore Ok. tornado you clearly see the destruction of these consumer and capital goods. If the destruction of wealth is difficult, or almost impossible to see, are the results of the destruction diminished? The Federal Reserve, through Government sanction, has destroyed more wealth than 100 tornadoes could have destroyed. THE FED’S DESTRUCTION IS HARD TO RECOGNIZE. The Federal Reserves counterfeiting [debasing] money, and artificially keeping interest rates low, is what caused the tech bubble in 2000, the housing bubble in 07-08,, and what is presently causing the bubble in the stock and bond markets, and the reflation of the housing bubble. When each new Fed induced bubble collapses, it destroys more wealth than what was destroyed when the previous bubble collapsed. How much more wealth will be destroyed when the current stock, bond, and housing bubbles burst, compared to the 08 housing bubble? 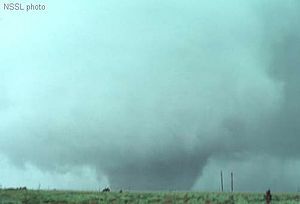 A tornado indiscriminately destroys and redistributes everything in its path. It redistributes destroyed wealth in the form of scrap over a wide area.Very little is salvageable. The Fed destroys an individuals wealth by redistributing it to those who receive the counterfeit money first, namely the banks and the Government. There is an estimated $2 billion worth of wealth destroyed in the Moore Ok. tornado. The Fed has been printing $85 billion worth of destructive counterfeit electronic dollars since September of 2012, on top of the almost $2.5 trillion created with QE 1, 2, and 3. The Fed buys Government bonds, and mortgage-backed securities from banks with the counterfeit dollars. The money that ends up in the hands of Government, through these bond purchases, is used for consumption with no corresponding production, this is wealth destruction. The money that ends up in the banks, from purchases of mortgage-backed securities, finds its way into the stock market and the housing market. This ends up being a transfer of wealth from all of us to the banks, or to insiders who know when to take profits before the collapse of these markets. You can see the $2 billion worth of destruction by the tornado because it is concentrated in a limited area. You can’t see the destruction caused by the counterfeiting of $85 billion per month because it is distributed across the whole country. It is represented in every under water mortgage, every business that went under or is barely hanging on, all the capital that is not being maintained or replaced, everyone who has taken a pay cut or whose hours have been cut back, all the people who have borrowed against their retirement accounts or taken money out of these accounts just to get by, all the people who went into huge amounts of debt at the height of the bubble and are now paying a larger percent of their present and future production to the banks, all the people who didn’t have a down payment for a mortgage but had the loan magically collateralized when the down payment was included in the loan, do I need to go on. All of these work together to take a higher percentage of what people produce, and transfer it to the banks. This amount of debt couldn’t have existed under normal market interest rates, and a money supply that couldn’t be inflated. A tornado isn’t in the same league as the Fed when it comes to destruction. The difference is that a tornado’s destruction can be seen and it is visually devastating. But the Fed’s destruction is not only difficult to see, the concept is “done it in a manner which not one man in a million is able to diagnose”. Are you that one in a million? If you are, you have a million people that need your help. Related article, Consumption Depletes What Has Been Produced And Saved, by austrianaddict.com. Related article, Capital Consumption, aka, Eating Our Seed Corn, by austrianaddict.com. Related article, you have to be all in when you read these, Charles Hugh Smith Hits It Out Of The Park With These Articles, at austrianaddict.com. This entry was posted on May 27, 2013 at 12:05 am and is filed under Econ. 201. You can subscribe via RSS 2.0 feed to this post's comments.